We are available and on call 24 hours a day 7 days a week ready to help you with your plumbing emergency. We can perform Leak Detection and Repairs today! A slab leak is a water leak that occurs in the water lines running below the concrete floor of your home or business. These leaks are primarily caused by age and corrosion due to mineral deposits that build up and react with our drinking water and the copper pipes. Depending on the size of the leak you may notice a loss of pressure or increased water bill. 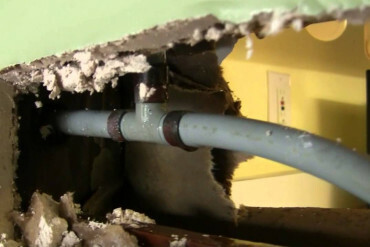 A leak in a copper pipe behind the wall is sometimes called a pin hole leak. These leaks are primarily caused by age and corrosion due to mineral deposits that react with our drinking water and the copper pipes. Water dripping or spraying in a wall can cause considerable damage and doesn't always affect water pressure. Your only indication of a leak may be a spongy floor, a visual damp spot, or moldy drywall. 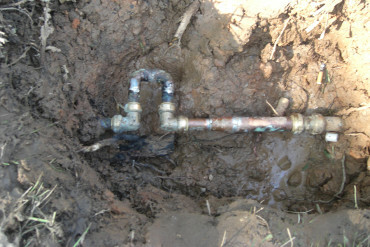 Yard leaks are water leaks in the piping that brings water into the home. Any leaks from the home to the meter box at the street are the customer's responsibility to repair. Water standing in a yard, water in or around a meter box, or an unusually high bill may indicate a water leak. These leaks are caused by a variety of problems including roots, digging, and corrosion due to age and mineral deposits. If you are looking for a plumber near me or a plumber in my area, then here is a list of areas we provide service for. We are fully staffed and ready to handle all your plumbing needs. 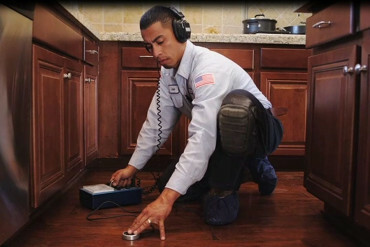 If you're experiencing a water leak, our years of experience and state-of-the-art leak locating technology can help pinpoint the exact source of the problem. 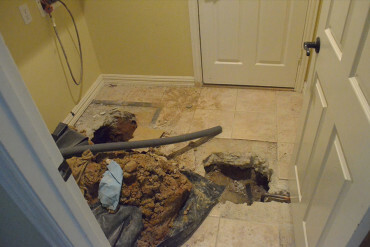 The poor quality of our water is the largest factor that contributes to the cause of water leaks. Mineral deposits and high levels of chlorine can cause corrosion in the copper pipes and damage to plumbing fixtures. Proper water filtration can greatly reduce the possibility of future leaks. In many cases high water pressure can be a cause of water leaks. Blue Sky Plumbing can measure your water pressure and install a water pressure regulator valve to correct the problem. Once the leak is found Blue Sky Plumbing can repair your leaky pipe, faucet, sink, toilet, tub, shower, drain, disposal, spigot, hose bib, and more. Additionally, our highly trained plumbers can help with the installation of new water lines in and outside of your house. If you are buying or selling a home it is crucial that your home's pipes are code compliant - frequently it turns out that they're not. Blue Sky Plumbing can help bring your home's pipes up to code.